First of all, this release just sounds fantastic. The rich audio and nicely mixed instrument levels work well to assert a commanding metal presence most of the time, but aren’t afraid to kind of lay off and let a lighter side take control and lift you away like “The Secret of Flight” does. This one sounds torn straight out of the eighties Dio playbook with catchy riffs and lighter drums that build to a subtle melodic beauty and layered clean vocals. The technical riffs thrown about only make the hooks stronger in a “TV Crimes” manner, while the chorus shifts nicely into more of a grander opus that does as the title and lyrics elude to and lifts your spirits skyward. Sadly, “Sons of Odin” tries to recapture this glory, but it just isn’t as powerful. What feels like a toned down Manowar with an emphasis on the bass guitar seems to have potential, but the final product just comes off like filler more than anything – an alright track that isn’t all that memorable and one of the few glaring faults of the album. And that’s a shame, really, given “Nosferatu (The Vampire’s Waltz)” is essentially the polar opposite of “The Secret of Flight”, taking that epic value that was just on display and coating it with a slow, brooding, near cinematic darkness fans of Horror Show by Iced Earth will warmly embrace, standing as a song so good you get it twice. Yes, Saxon has two versions of this track on both the standard and limited editions. The first is the obvious final product, but the second iteration called the raw version doesn’t have the additional keyboards and gospel chanting effects. It’s a different experience all together with what seems to be some additional changes in placement despite only being one second longer, though not actually of a lower, pre-mastered quality like you might think or expect. But yet there’s still more to really take in with this effort than the Saxon we have come to expect. “Predator” is one of the more unique tracks on the effort, if not of the band’s career. The crushing chugs of the chorus stand out to play up the ferocity of the song’s topic, while that intimidation exists elsewhere with the inclusion of guttural vocals meshed with the signature clean singing and lighter rock verses. But what is perhaps the most impactful of all is “They Played Rock and Roll”, a song composed in memory of Motörhead‘s Lemmy Kilmister, which vocalist Biff Byford commented to blabbermouth.net stating “[It’s] called ‘They Played Rock And Roll’, ’cause that’s what Lemmy [late MOTÖRHEAD frontman] used to say every night [from the stage].” It’s a fun little piece of early nostalgia and homage any speed metal fan will recognize [or in my case swear it’s a flat-out cover] and immediately respect. 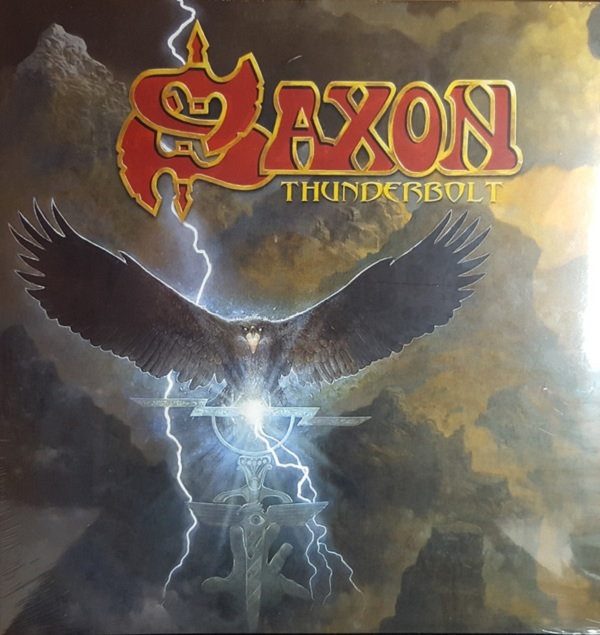 What Thunderbolt ends up being is not only a collectioon of what has made Saxon such a dominant force over the years, ranging from nods to their early days with “Speed Merchant” reminiscent of “Wheels of Steel” for a modern age to their more powerful and even darker current dabblings like “Nosferatu (The Vampire’s Waltz)”, but also a bit experimental and sometimes heartfelt experience. Sure, the effort becomes a bit standard by the time you hit “A Wizard’s Tale”, but with the exception of the underwhelming “Sons of Odin” even the less-than-lustrous cuts are still pretty good in their own right. If you’re a fan of traditional heavy metal, that NWOBHM sound, or just a long time Saxon loyalist, this is an album that assures you the band not only continues to grow, but refuses to let you down. Digital review copy of this release provided by Silver Lining Music via New Ocean Media.